Born with a perfect memory, Lady Elizabeth Beckett has become one of the world's most notorious spies, despite being the daughter of a duke. She is shielded only by her code name: Shadow. When young ladies of High Society begin disappearing from London, Eliza has no doubt who is orchestrating these crimes; a heinous man she has been investigating for years. Vowing to save them before they are sold to the highest bidder, she must risk everything to stop him. Lord Sinclair was perfectly content being the second son of a marquess, but when his brother is murdered, he is thrust into a position he has not been prepared for and does not desire. As an agent for the Crown, he is expected to retire now that he is the heir, but he's been granted special permission for one more mission... to obtain justice for his murdered brother. Used to keeping secrets, Lady Eliza and Lord Sinclair must learn to open up to each other when they are assigned as partners to bring down the same ruthless man and his brutal empire of abduction and slavery. As Eliza's tainted past becomes too much for her to bear alone, can she learn to trust her new partner with her secrets, her life, and possibly her heart? 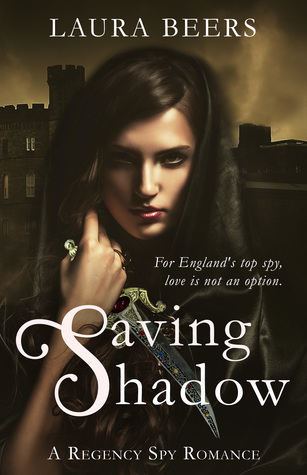 Saving Shadow is an entertaining read with a new take on the Regency genre. The inclusion of human trafficking as an issue of the time isn't something I can recall reading in other books in this genre. I'm not sure how prevalent it was, but it is an issue that I'm concerned about now, and the desire to find and free the women involved helped connect me to the story. Although this isn't the first Regency spy novel I've read, very few have a woman as a spy, and those that do don't have a woman so involved. Eliza is such a unique character. Her photographic memory and her ability to break codes made her invaluable as a spy. She was also quite skilled as a . . . marksman. I'm not sure that that would be the correct word (since she wasn't using guns), but if you were a bad guy, you wouldn't want her involved if you wanted to live. That was definitely not a trait for women in other Regency novels I've read, but I felt the author did a good job of unveiling why Eliza was the way she was. I liked Lord Sinclair, although the relationship that developed between him and Eliza seemed very fast and their intimacy seemed to walk the line of a clean romance, especially for a time period that was so focused on propriety. I noticed a handful of swearwords, and would have loved if those weren't included (mild as they may be). Overall, I thought this was a good story, and I plan on reading the next book in the series. You know when life happens and the book that you were reading, and enjoying, doesn't get finished in a timely manner like normal, and that kind of kills the book? Anyone else ever do that? I felt like that happened with me and Saving Shadow. I was really into it, but I had to put it down to focus on some other things (i.e. life) and after I picked it up my mood just tanked. So I'm really interested in reading the second book to see if that happens again. Anyway, I actually liked Eliza's character. Although I did find her, and her whole family actually, a little blood-thirsty. We sort of see the pain and anguish of taking another's life, but in the next breath someone in the family says, "I'll just kill him". That kind of bothered me a little bit. The relationship moved a little quickly too, and seemed more based on attraction than any lasting emotional bonds. Lord Sinclair wasn't quite the gentlemen I normally like my men to be, but he was an entertaining character. Head's up that content wise there is some swearing and passionate kissing. I struggled with how quickly the relationship came about. One minute, Eliza hates Benedict, and the next, he's pressuring her to kiss him. I do wish the romance was developed a bit more, instead of rushing into it do fast. The spy part was intriguing, especially since it was a female in that time period. Definitely something that would cause scandal if it were known by anyone. Eliza knows what she wants and works hard to get it, even though she ends up fighting demons because of her chosen career path. There is enough solved in this story that you're not left with a complete cliff-hangar, but things are definitely left wide-open for a sequel. Just be aware that there are some "Bible swears" throughout the story. Not a whole lot, but they are there. Source: We received copies from the author in exchange for an honest review.